"No amount of attention during production is more important than that of the projectionist, who, with care and precision, shows the movie to the theater’s waiting guests." Couldn't be truer. They continue: "Bad projection can spoil the years of work that were put into the making of the movie. Perfect Projection literally makes it shine, and causes audiences to come back for more." Pixar has relaunched a website for projectionists just in time for Brave, their short La Luna, and two new Pixar trailers, to arrive in theaters. They go to lengths to specify every last technical detail to make sure the experience everywhere is perfect. I first caught wind of the site from our friends at Upcoming Pixar, who wrote a post stating that the Pixar Projection website had "reopened". Meaning this isn't a new site, but its been around for a while for most of their yearly releases. The page now contains opening remarks from co-directors Mark Andrews and Brenda Chapman as well: "We ask you to make Brave look and sound the very best it can in your theater. Without your commitment to excellent presentation, the audience doesn’t see how hard we work to make a beautiful image or a dynamic soundtrack." Yep. I love every last word on here, it's utterly brilliant, perfect. 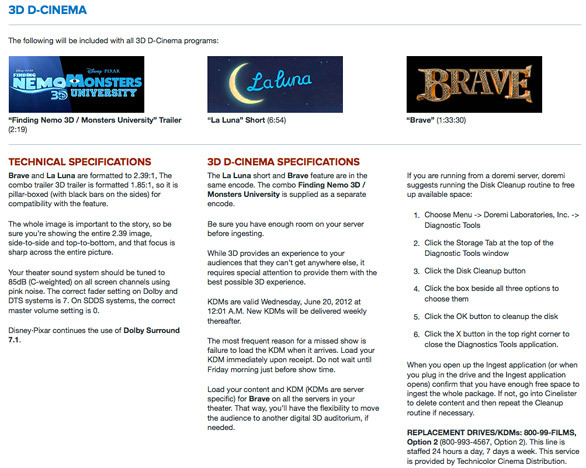 The 3D page (seen below) features information on all three of their major offerings as part of Brave. They include complete technical specs for the trailers and files, a guide on how to setup the 3D presentation so it's perfect, visual graphs & markers to test, and much more. While I'm sure most movie theaters have their own testing & configuration procedures, it's always great to see filmmakers themselves go so far as to make sure every last detail is perfect. Because they know just how much rests on the projectionist doing their job right. One of my favorite lines on the site: "The whole image is important to the story, so be sure you’re showing the entire 2.39 image, side-to-side and top-to-bottom, and that focus is sharp across the entire picture." Indeed. How many times do you see a poorly framed movie? While this site was made "for the exclusive use of projectionists and technicians exhibiting Brave", I think it deserves to be seen and spread, if only to further build a movement around "Perfect Projection", as they've dubbed it. It's also cool to see that they have 24 hour instant print replacement and technical support, and that anything that breaks down can be fixed quickly. Gotta love the movie industry, and studios that really care about the quality of presentation. 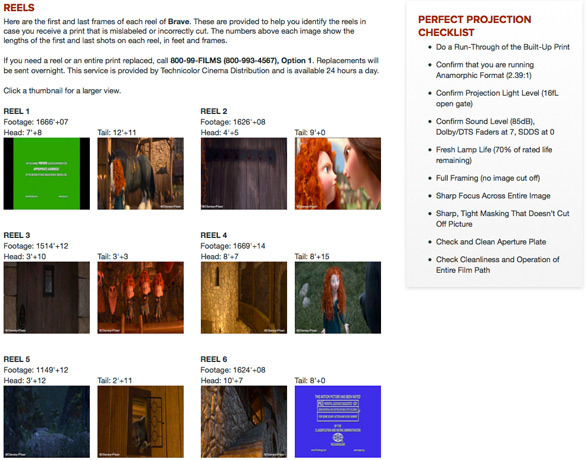 I wish every single theater used that projection checklist before every showing. "You are our gatekeepers of quality. Please take the time to run through the movie before your first screening to be sure the picture looks bright and vibrant, and the audio levels are properly set. I count on you to help me bring my film to the audience in the best way possible." Check out the site at projection.pixar.com if you're interested, send it to any projectionist or movie theater employees you know, and spread the word about "Perfect Projection", which is something we should all be demanding every time we see a movie. Shouldn't expect anything less. I thought I couldn't love this studio any more than I do, but discovering this site just shows how much they care about the audience as much as they care about their movies. Quality and perfection from top to bottom. I do like the part with the first and last frame of each reel. It isn't till you receive an incorrectly labelled print on the day it's playing (so no time to test it before the screening) that you can truly appreciate how helpful that is. Though I do think the rest is pretty self explanatory. It's more a matter of there being 1 projectionist to 10+ cinemas as well as being in charge of any maintenance or technical issues etc. If a projector breaks down you have to just kind of hope the other cinemas can take care of themselves while you fix the problem. It's a nice thought but I don't know any projectionists who are aware of this site. Also distributors should think about sending keys that open the night before so the whole film can be checked before it plays to the public. Just because it's digital doesn't mean it's going to play perfectly from beginning to end. I was thinking that too. The first and last is a great idea. Though the picture reference could easily just be printed off and packed with the film. They all ready send pages with the other info, they've just gone digital with that now, as well. Real handy when there's no internet in the projection booth. Pixar is " Brave "
Why did you (Firstshowing) blur out the images on the last picture?